If you want to extend the life of your carpeting, you need to clean it often. A dirty carpet contains soil and other debris that will wear your carpet's fibers. Every time you walk on your dirty carpet, you are grinding the soil into the fibers, permanently scratching and wearing them. A carpet cleaning will remove these damaging particles. But how often should you clean it? How often you clean your carpet depends on a number of different factors. You must consider how many people are in your home, if you have kids, if you have pets and whether or not smokers are in your home. For example, if you have a house with two adults, you should clean your carpet every six to twelve months. If those two people are smokers, you should clean it every four months. If you have children or pets in your home, you should clean it at least every 6 months and if you have kids and pets, you better make it every three months. 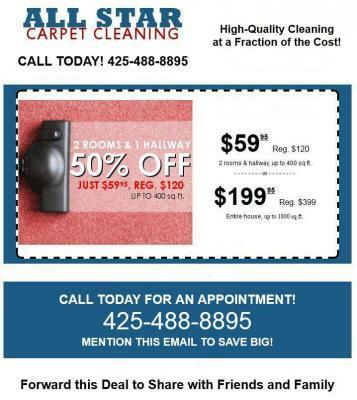 All Star Carpet Cleaning reads a lot of articles this is a very good article about Carpet Cleaning in Bothell,Wa.